I have wanted to do a field trip hop for months now. I am just now getting this idea off the ground. My very good friend Lynda was kind enough to make the field trip banner and button way back in April when I first began talking about my hop idea. However, as you know life get in the way with things like home schooling, holidays and family visiting. However, today I can announce the first month of Field trip hopping can begin!!! Homeschooling can take place anywhere and many homeschooling families utilize field trips as a way of re enforcing what their children are learning. I have been home schooling for nearly 3 years and my family go on lots of field trips. We love them!! So I thought others might feel the same way. 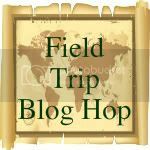 So if you have taken your home school on a field trip this month, write about it and link up here so others can share in your adventures. 1. Link up all your home school field trip adventures for the whole month! 2. Holiday post are okay as long as learning was occurring, as homeschoolers we all know learning occurs everywhere:). 3. Comment on blogs -- everyone love getting comments on their post so share the love. 4. This is a new hop so grab a button and spread the word. The more that participate the more fun we will all have! 5. Follow your host at Life's Adventures -- I will follow back. 6. This is a family friendly blog any post deemed inappropriate will be remove. Hi Everyone -- Due to technical difficulties this morning my original post has vanished as well as all your wonderful comments. I am on a learning curve so bare with me as this is the fist time I have used Linky. However the link now appears to be working and I will have to work on tweaking my post a bit later as my children need my attention. Hope to see you join in the Hop!!!! I have no idea why my link posted no thumbnail! LOL . It is a very cute frog though. Happy to be joining this link up. I look forward to reading about everyone's exciting adventures! I love traveling while homeschooling! I'm a new follower who will be back to see what others are doing and seeing this summer. Looks like a wonderful hop full of fun places!! This is so wonderful. I had been thinking about doing this. I'll have to make sure to add stuff over here too!! You are awesome!!! WOW Girl look at you go! This is awesome! Thanks for hosting. I found you through Chestnut Grove Academy. I really enjoyed taking a look at everyone's field trips so far! Such beautiful pictures and really wonderful information. Thanks for hosting this hop. So glad to find this via Jen @ Forever, For Always, No Matter What! I'm now following in GFC, so I won't lose track of it. I linked 2 recent family field trips and will make sure I come back next month once I get a few more posts written up for my blog. Added two posts, all the way from South Africa-Cape Town-this way by the time you come for a visit you'll have a good idea of places to visit! If you visit my blog take a look at our past outings-maybe there'll be some you'd be interested in going on when you come to SOuth Africa! Thanks Nikki going over to your site right now to explore of your places. We are so excited to be going next year. I LOVE this idea! 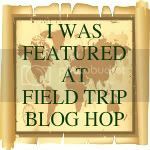 I put your button on my blog and will be going back to add our field trips in very soon.